Commercial design starts with a strong understanding of our clients’ needs. S&T can then convert these needs into buildings that not only meet commercial realities but also create dynamic environments that promote better communication, flexibility and inspiration. S&T works closely with property developers and project managers to develop beautiful buildings that help shape our cities with highly functional as well as sustainable environments. S&T are the building services engineers for the Kiwi Property Group (KP) $67M major upgrade of 56 The Terrace, Wellington. S&T employs Engineers and Architects who work together to create unique blends of integrated design. The result of this project is an open and light space which encourages our left-brain and right-brain thinkers to work together. ACC were impressed by S&T’s professional approach to design, commitment to provide exceptional client service and our track record for creating inspirational and sustainable environments on a budget. S&T provided this global bio-pharmaceutical company with an office layout and new interior which supported its innovative and collaborative working culture. S&T were involved in creating one of NZ's most energy-efficient buildings. Key features include an underfloor air distribution air-conditioning system and a twin-skin façade with motorised blinds to optimise energy use. S&T's brief was to create an industrial, stripped-back aesthetic. The design team worked closely with REANNZ’s Chief Executive Donald Clark to ensure that the client was happy with the end result. This small yet robust and quirky cafe was designed by S&T. It takes pride of place adjacent to QEII Square and within the new forecourt of the One Queen Street building in downtown Auckland. S&T created a fresh new office for IT company, Intergen. The vibrant “Intergen Yellow” has been incorporated into the design through feature walls and screen dividers. S&T transformed a tired, uninspiring space into a hub of collaboration. Microsoft's interior now provides for different working styles and better reflects the global company's brand. S&T created a fresh working space for staff who had previously been housed in three separate buildings. The design reflects the Mighty River Power Brand while maximising its location by the Waikato River. S&T's Auckland office was designed to reflect the company’s new brand identity. Light features strongly in the design and provides a welcoming environment for clients. S&T revitalised Mercury Energy's Auckland Office. The original rabbit warren of offices was transformed into a stimulating open-plan space which encourages interaction and productivity. S&T refurbished FMG's Head Office located in a building famous for it’s ‘crystaline’ shape. The new, modern design better exploits the angles, natural light and views. S&T astonished occupants with its transformation into a high-class, elegant building. The original exterior which was painted blue with black joinery and dingy steel balconies is now unrecognisable. S&T created vibrant interior design fit-outs of Cisco's Auckland and Wellington offices. The fitouts also included specialist training rooms, boardrooms and telepresence rooms. S&T was privileged to lead the preservation work to one of Wellington’s most significant heritage buildings. Built in 1928, the AMP Society's exterior was carefully repaired and restored. 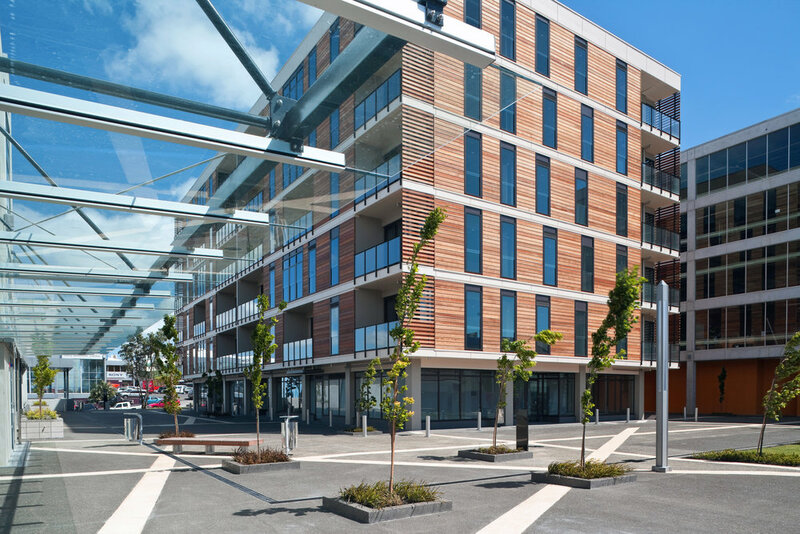 This large, mixed use development by S&T has created a new urban precinct in Newmarket, Auckland. Pedestrians are also catered for within the plaza surrounded by apartments, retail and office spaces. S&T was again involved in the re-development of a building originally designed by them in 1980. Wrapped in coloured LED lights, the building also creates a beautiful metropolitan ambiance at night. S&T along with The Edge are leading a large-scale renewal of the external building surfaces Auckland's iconic Aotea Centre. Built in the early 1990s, age and end-of-life materials have recently caused widespread water ingress issues. S&T Building Services Engineers dismantled and reinstated all engineering services elements to Wellington's tallest building.